Primary hyperoxaluria type-1 (PH-1) is an autosomal recessive inherited metabolic disease caused by deficiency of the hepatic peroxisomal enzyme alanine glyoxylate aminotransferase (AGT).Excessive oxalates formed by the liver and excreted by the kidney lead to a wide spectrum of phenotypes ranging from renal failure in infancy to only renal stones in late adulthood.According to the severity of the disease and time of presentation, three clinical subgroups are distinguished within PH-1.First, a rare infantile form with early renal insufficiency; second, a rare late-onset form with occasional stone passage in late adult- hood and with a good prognosis with respect to renal function and third, the most common form, with recurrent urolithiasis or nephro- calcinosis and often, progressive renal insuffi- ciency. The purpose of this retrospective study is to determine the clinical and radiological features of children who were diagnosed with PH-1 during the 1[st]year of life. We will also try to establish a correlation between these characteristics and the progression to the end- stage renal disease (ESRD). We reviewed the records of all children with PH-1 diagnosed and followed-up at our de- partment between January 1995 and December 2013. Among them, only infants younger than 12 months of age were retrospectively enrolled in the study. Patients were evaluated for pre- senting symptoms, family history of PH-1, consanguinity, gestational age, birth weight, presence of nephrocalcinosis and/or urolithia- sis, extrarenal involvements, diagnostic proce- dures, therapeutic interventions, and outcome. The study included 14 children (8 males and 6 females) from 12 families diagnosed with PH-1 in the first year of life. All patients were of Tunisian origin except for two families, who were of Libyan descent. Most children were offspring of consanguineous mating (10 of 14) with intermarriage of first-degree cousins being the most common pattern. In nine patients, there was a family history of renal stone. The age at diagnosis ranged bet- ween two and 10 months (mean age: 4.4 months). Uremia was the initial symptom in ten patients. Four of them developed seizures subsequently. Two children did not present any symptoms and were examined because they had a sibling with PH-1. One patient had vomiting since the age of one month. Ultra- sonography (requested because of suspected hypertrophic pyloric stenosis) showed bilateral cortical nephrocalcinosis. The last patient was investigated for anemia. 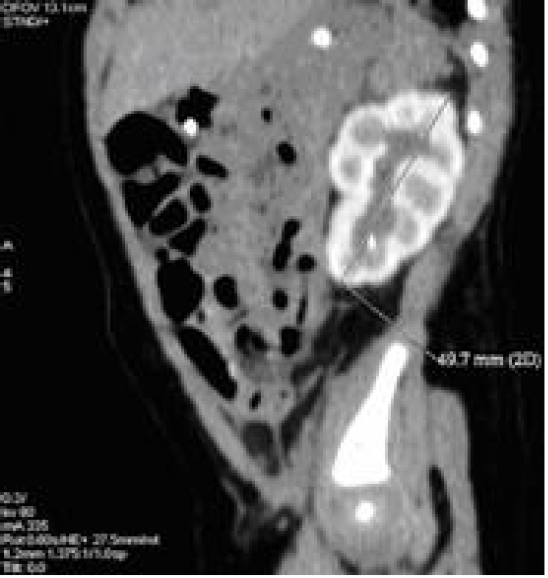 The sonography examinations revealed five patients with cortical nephrocalcinosis, two patients with medullary nephrocalcinosis, and five patients with global nephrocalcinosis. Two cases of urolithiasis were found. In two patients, ultrasonography was not contributory to the diagnosis. Investigated further, a com- puterized tomography (CT) scan showed bila- teral cortical nephrocalcinosis [Figure 1]. The diagnosis was established in nine pa- tients by the positive family history of PH-1, bilateral nephrocalcinosis, and quantitative crystalluria showing calcium oxalate mono- hydrate crystals (Type 1c whewellite). In four patients,the diagnosis was performed with molecular analysis of DNA and showed a homozygote mutation: I244T [Table 1]. 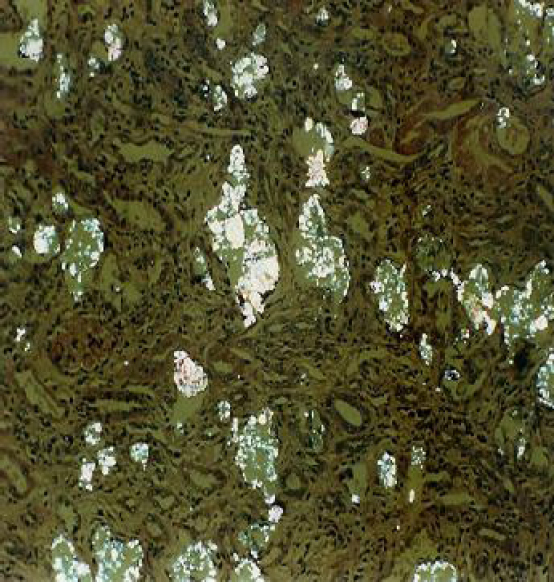 In the last patient, who did not have a family history of PH-1, the diagnosis was made by kidney biopsy postmortem, which showed extensive oxalate crystal deposition [Figure 2]. As shown in [Table 2], 11 patients already had ESRD at admission to our department. Automated peritoneal dialysis was initiated. Seven of them died. Four patients are still alive, receiving peritoneal dialysis and waiting for a combined kidney and liver transplan- tation. Medical treatment of patients with normal renal function or moderate reduction in glomerular filtration rate (GFR) sulfate and pyridoxine. Two patients from the same family were considered as pyridoxine responsive. They had normal renal functions. The follow- up was at 15 and 22 months. In one patient, there was no reduction of urinary oxalate level despite a well-conducted treatment. He is now 5-year-old and has a severe renal impairment (GFR: 25 mL/min/1.73m²). The infantile form of PH-1 is considered as a life-threatening condition because of rapid progression to ESRD, due to both increased oxalate load and reduced GFR.Its incidence is variable, depending on the series reported in the literature, but it is certainly underestimated. According to Cochat et al,up to 16% of pa- tients with PH-1 experience initial symptoms during the first year of life. In our study, the infantile form amounted to 18% of patients ob- served and followed-up in our department.The sample size was as seen in our center; it should be noted that our center caters to the majority of Tunisian children with kidney disease. Our study supports other reported data which showed that the most common clinical presen- tation of PH-1 in young children is dominated by nephrocalcinosis and early progressive renal failure.Several pathophysiologic explanations have been attempted to explain this mode of presentation: inability of the immature glome- ruli to clear the oxalate excess, elevated oxa- late production caused by a preferred glyo- xylate-to-oxalate pathway and high rates of both urine calcium and oxalate excretion.,Leumann et alhave shown that the oxalate/ creatinine ratio in infants is significantly higher than in children more than one year of age. The reason for the decline in this ratio with increasing age remains unclear. It is probably related to the rapid growth during the 1st year of life. The diagnosis of infantile PH is usually de- layed, and most patients are first seen with ESRD before the age of four months and die within the 1st year.This delay in diagnosis is probably related to inadequate metabolic scree- ning strategies and failure to achieve extensive family screening of patients. In Tunisia (deve- loping country), the absence of antenatal screening is an additional factor leading to late detection of the disease. During the 1st year of life, and without a family history of PH-1, a definitive diagnosis is difficult to establish, especially in patients with ESRD. The use of urine levels for diagnosis becomes less accu- rate and more difficult when the GFR drops below 10 mL/min.Data from renal ultrasound, when performed, constitute an important con- tribution through the detection of nephrocal- cinosis.However, the appearance of nephro- calcinosis on renal sonography is sometimes atypical and shows a global cortical hyperecho- genicity which can be seen in other diseases, in particular acute cortical necrosis.There- fore, renal CT must be considered to confirm the presence of nephrocalcinosis.It contri- buted considerably in our study in patients who had no family history of nephrocalcinosis. The enzymatic diagnosis from a liver biopsy specimen, when available, can confirm the diagnosis of PH-1 by measuring AGT activity. The diagnosis can also be made by testing DNA for mutations known to cause PH-1.These diagnostic procedures require special equipment and training which are not available in developing countries such as Tunisia. Renal biopsy is an important procedure to confirm the diagnosis. It typically shows extensive oxalate deposition.In patients with normal renal function or with moderate reduction of GFR, the diagnosis can be made by analysis of crystals, plasma oxalate, urinary excretion of oxalate, and urinary glycolate. Because of the poor prognosis of infantile PH-1, the diagnosis should be made as early as possible in order to start treatment that may delay the onset of ESRD. High fluid intake, urine calcium oxalate crystallization inhibitors, and pharmacological doses of pyridoxine are the main therapeutic measures.However, they are not commonly used in most developing countries because of the nonavailability of crystallization inhibitors and pyridoxine and the difficulty of adapted hydration in warm climate countries. Thus, we believe that pre- natal diagnosis seems to be the best procedure to reduce the incidence of the disease. It is reliable in the first trimester of pregnancy and should be widely applied to large kindred with index cases in order to offer the possibility of therapeutic abortion on time.This is parti- cularly relevant since preemptive liver trans- plantation or combined liver-kidney transplan- tation which are the optimal treatments of the diseaseare not feasible in developing countries, especially at an early age. Leumann E, Hoppe B. The primary hyper- oxalurias. J Am Soc Nephrol 2001;12:1986- 93. Latta K, Brodehl J. Primary hyperoxaluria type I. Eur J Pediatr 1990;149:518-22. Cochat P, Basmaison O. Current approaches to the management of primary hyperoxaluria. Arch Dis Child 2000;82:470-3. Cochat P, Liutkus A, Fargue S, Basmaison O, Ranchin B, Rolland MO. Primary hyper- oxaluria type 1: still challenging! Pediatr Nephrol 2006;21:1075-81. Cochat P, Koch Nogueira PC, Mahmoud MA, Jamieson NV, Scheinman JI, Rolland MO. Primary hyperoxaluria in infants: medical, ethical, and economic issues. J Pediatr 1999; 135:746-50. Gargah T, Khelil N, Youssef G, Karoui W, Lakhoua MR, Abdelmoula J. Primary hyper- oxaluria type 1 in Tunisian children. Saudi J Kidney Dis Transpl 2012;23:385-90. Raju DL, Cantarovich M, Brisson ML, Tchervenkov J, Lipman ML. Primary hyper- oxaluria: clinical course, diagnosis, and treat- ment after kidney failure. Am J Kidney Dis 2008;51:e1-5. Barratt TM, Kasidas GP, Murdoch I, Rose GA. Urinary oxalate and glycolate excretion and plasma oxalate concentration. Arch Dis Child 1991;66:501-3. Leumann EP, Niederwieser A, Fanconi A. New aspects of infantile oxalosis. Pediatr Nephrol 1987;1:531-5. Harambat J, van Stralen KJ, Espinosa L, et al. Characteristics and outcomes of children with primary oxalosis requiring renal replacement therapy. Clin J Am Soc Nephrol 2012;7:458- 65. Diallo O, Janssens F, Hall M, Avni EF. Type 1 primary hyperoxaluria in pediatric patients: renal sonographic patterns. AJR Am J Roentgenol 2004;183:1767-70. Erden A, Fitoz S, Karagülle T, Akyar S. Hypo- echoic renal peripyramidal rings in primary hyperoxaluria. AJR Am J Roentgenol 2000; 174:263-4. Akhan O, Ozmen MN, Coskun M, Ozen S, Akata D, Saatçi U. Systemic oxalosis: patho-gnomonic renal and specific extrarenal fin- dings on US and CT. Pediatr Radiol 1995; 25:15-6. Doganavsargil B, Akil I, Sen S, Mir S, Basdemir G. Autopsy findings of a case with oxalosis. Pediatr Dev Pathol 2009;12:229-32. Cochat P, Pichault V, Bacchetta J, et al. Nephrolithiasis related to inborn metabolic diseases. Pediatr Nephrol 2010;25:415-24. Rumsby G. Experience in prenatal diagnosis of primary hyperoxaluria type 1. J Nephrol 1998; 11 Suppl 1:13-4. Chava SP, Singh B, Pal S, Dhawan A, Heaton ND. Indications for combined liver and kidney transplantation in children. Pediatr Transplant 2009;13:661-9.